Enjoy the Amazing Health Benefits of this unique blend of Rooibos and Buchu Tea by Topqualitea! Are you looking for a refreshing, all natural beverage that you can enjoy all day long with no side effects? Then look no further than Rooibos Buchu tea by Topqualitea! This uniquely delicious and healthy tea combines the numerous health benefits of Rooibos tea with the equally numerous and amazing benefits of Buchu. Topqualitea is a company that stands behinds its products and aims at 100% customer satisfaction. This is why we back each Rooibos Buchu tea pack with a full money back guarantee. With nothing to lose, order yours today and taste the difference! DISCOVER THE SECRET MIRACLE OF BUCHU TEA: Buchu is a Fynbos shrub that is indigenous to South Africa and it's numerous health benefits have been known for centuries. Buchu is a natural kidney cleanse and bladder care formula for optimal kidney and urinary health. It has excellent anti-bacterial, anti-fungal and anti-spasmodic properties that provide welcome relief from bloating. START YOUR DAY RIGHT: Rise and shine with the exquisite, sweet aroma of Rooibos Buchu tea, perfect to get you ready for your day! Its full body and natural Rooibos sweetness makes this delicious beverage an ideal way to kick start your day, or even help you de-stress and relax in the afternoon. Simply add cream or honey and enjoy it hot or cold, all year long! Each box contains 4 sealed packs of 20 teabags each to ensure unmatched freshness and heavenly taste in every cup. GET THE NEW HEALTH TREND: Packed with an impressively large amount of powerful antioxidants, minerals, iron, calcium and naturally detoxifying ingredients, this combination of Buchu and Rooibos tea offers a long list of health benefits that rival those of green and black tea (including matcha green tea). Buchu tea can help you boost your immunity, fight a large range of diseases, maintain healthy bones, lower blood sugar level, soothe the nervous system and increase longevity! CHOOSE ETHICALLY & EMPOWER FAIR TRADE: Enjoy the multiple health benefits and feel good about it, too! 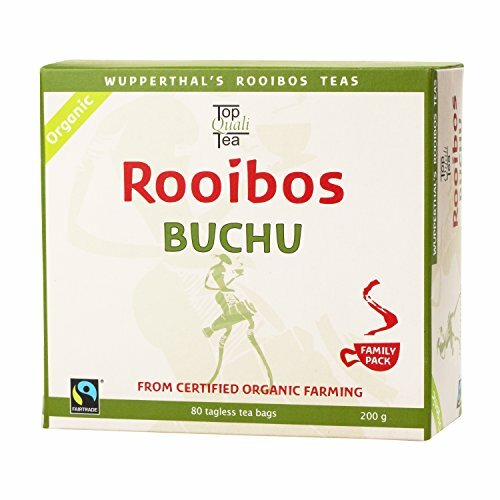 With every pack of our Buchu tea you purchase, you are helping us empower small scale farmers in South Africa, ensure humane working conditions and environmentally friendly production methods that benefit the planet as a whole. GET IT WITH CONFIDENCE: Being so sure about the top quality of our organic rooibos buchu tea, we are able to offer you a 100% money back guarantee of complete satisfaction. If for any reason this product does not meet or exceed your expectations, feel free to return it for a hassle-free refund. What could you lose? If you have any questions about this product by Topqualitea, contact us by completing and submitting the form below. If you are looking for a specif part number, please include it with your message.